Hammock Dunes is a premier gated golf community located on Florida’s Atlantic Ocean with 1.6 miles of direct beach accesses and 2 members only golf courses. The Hammock Dunes community spreads out over almost 1,000 acres and offers high end ocean front condominiums, single family homes, and large estate homes on the ocean as well as large oceanfront lots upon which to build your dream home. The oceanfront Links course was designed by Tom Fazio, while the Creek course is located on the Intracoastal Waterway and was designed by Rees Jones. Around the golf course and the lakes you find some smaller single family homes and patio homes. 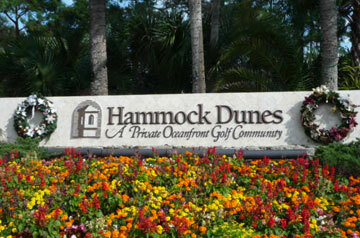 Hammock Dunes is recognized as one of America’s top private clubs. It offers 5 tennis courts, 2 oceanfront croquet courts, bocce courts, fitness center, heated pool, spa and fine and casual oceanfront dining.